My father, may he rest in peace, was a champion Yankee gardener, as proud of his vegetables as he was of the considerable flowerbeds that surrounded his bayside home. He did almost all the work himself — preparing the beds and cold frames, planting, transplanting, weeding, deadheading and harvesting — although there was a man who came to mow the lawns once a week or so. Like most champion gardeners in these chilly northern parts, my father relished especially the first springtime harvest, no matter what it was: first peas, first strawberries, first lettuce (served at the table the old-fashioned way, with sugar and vinegar as a dressing) and above all first asparagus. He was also first up in the morning and out in his garden almost at sunrise, snapping off the tender shoots of asparagus right at the base. Then for breakfast we’d have aspara-grass, as we called it, cooked in my father’s unique and (fortunately) almost inimitable fashion, boiled or steamed until the poor, plump stalks were limp and gray with exhaustion, then piled them atop a toasted slice of Wonder Bread, liberally spread with butter, and with more butter, melted now, pooled on top — along with the leftover juices, which of course turned the toast to soggy pap. My father was a much better gardener than he was a cook. 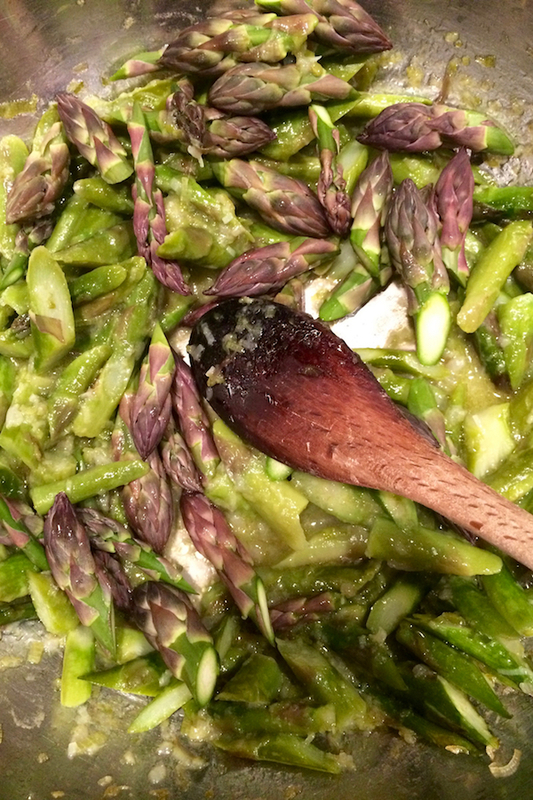 I was fully grown before I discovered the pleasures of underdone asparagus and had to wait for my garden patch before I understood that the best asparagus in the world, like the best peas, is consumed standing in the garden and contemplatively chewing on what you’ve harvested only seconds before. Come to think of it, because all fruits and vegetables begin to deteriorate in the ordinary course of things as soon as they’re harvested, don’t you get the fullest impact of all those vitamins, minerals and fiber when you eat food, as it were, straight from the ground? I’m no raw foodist, but it does seem to me there’s an argument there. Fast forward to the present day, when my daughter, Sara, and I were working on our first cookbook together, “The Four Seasons of Pasta.” Of course, the spring season must have asparagus pasta recipes, and so we set diligently to work. I’ve done tagliatelle for years with grilled or seared asparagus and sliced red onions, tossed in a creamy goat-cheese dressing, the asparagus just barely cooked, so it still has a lot of crunchiness. As they say on Facebook: YUM! But I was stopped in my tracks when Sara proposed a recipe that’s a favorite from her restaurant: pappardelle with long-cooked asparagus. “Long cooked?” I shuddered, remembering those breakfasts of soggy toast and soft, discolored spears of asparagus. She ignored my qualms and went ahead with the recipe. And you know what? It was terrific! The melting softness of the asparagus sauce, made from the stalks cut small and indeed overcooked, contrasts beautifully with the still-crisp flavors of the tips, which retain some of their brightness because they’re cooked for a short time. 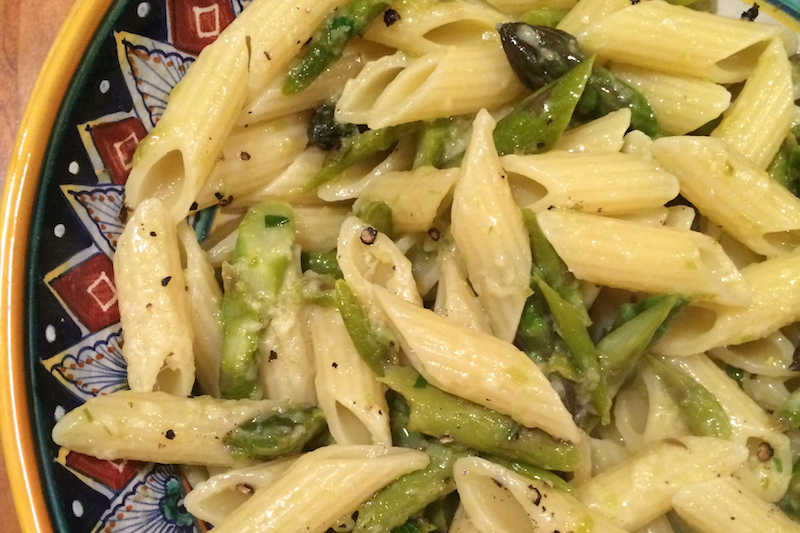 We made it again for dinner recently, with the first of the local asparagus, and once again marveled at how pasta can serve as a perfect foil for the first of spring’s offerings, whether peas or asparagus or possibly even strawberries. Asparagus is a delight when freshly picked and barely blanched. Its sweet vegetal flavors are a welcome herald to spring. But as the season winds on and the spears get fatter and a little tighter, it’s also good cooked thoroughly, to break down the tough fibers and pull out a little extra sweetness along the way. It’s great served over pappardelle — or any other kind of long, broad noodles, fettuccine, for instance, or even penne. 1. Trim the asparagus by snapping off the bottoms, which break where the stem starts to get woody. Cut the stalks into 2-inch lengths, setting the tips aside. 2. Combine the butter and oil over medium heat in a saucepan or deep skillet. When the butter begins to foam, add the minced shallot (or spring onion) and the asparagus pieces, except for the tops, with a good pinch of salt and pepper to taste. Cook briskly until the shallots and asparagus take on a little color — about 8 to 10 minutes. Then turn the heat down and add the cream, 2 tablespoons water, the asparagus tips and half the basil leaves. Cover the pan and continue cooking, until the asparagus tips are tender and the liquid in the pan is reduced by half. 3. In the meantime, bring a large pot of water to a boil. When the asparagus sauce is ready, cook the pasta according to package directions, until it is al dente. 4. Have ready a warm serving bowl. Drain the pasta and toss in the bowl with the asparagus sauce, the remaining basil, and the cheese. Add black pepper to the top and serve immediately. Note: You can vary the flavors by using other fresh spring herbs in place of the basil — lovage, chervil, even plain old flat-leaf Italian parsley will be very good.